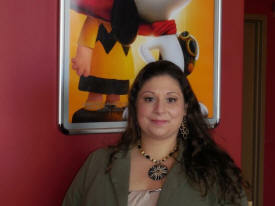 In July 2014, Kimberly Wheeler [photo] came to the Massachusetts Small Business Development Center with hopes of receiving business advice for her idea to reopen the cinema in Agawam. After being in business for over 40 years, the cinema had closed earlier that year in May due to the changes of the technology in the film industry. As a lifelong resident of Agawam, Kim felt that reopening the theatre would be an opportunity to keep the cinematic history alive for the community. After a lot of hard work, Kim accomplished her goal and reopened the cinema in November 2015.